Architects and martial artists, the Aspects of Earth are the spiritualists and builders of the Dragon-Blooded Host. Yet, these rugged Exalts are far more than mere craftsmen. With their superhuman endurance and their devotion to the Dragon of Stability, Aspects of Earth are the strong foundation of the Dragon-Blooded and the bulwarks of their people. 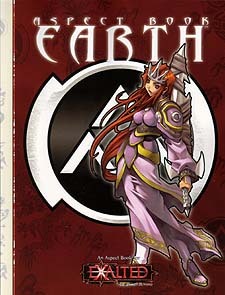 Aspect Book: Earth is the second Aspect book for Exalted - books detailing the differing aspects of the Terrestrial Exalted. Within it lie the stories of five members of the aspect, from those who have just graduated secondary school to the ruthless Mnemon. This book also contains the new magical powers, rules and artifacts that Earth-aspected characters will need to claim their role among their people as arthitects and martial artists without compare.